I know who will be the next generation of activists in my family … my six-year old granddaughter! Actually, I think her two younger sisters will join her, but she’s definitely already a leader amongst her peers. Her first grade class recently had a field trip to the Monterey Bay Aquarium. This was a big adventure for the first graders. They were taking a charter bus, traveling 150 miles, and going to be gone all day. 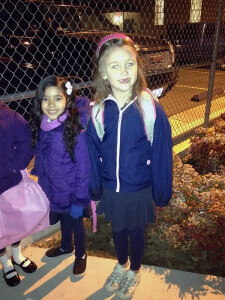 They were so excited as their parents dropped them off before dawn. I’m sure their parents had first-time-my-child-is-entrusted-to-a-long-distance-trip anxiety. I remember well those milestones of my sons growing up and moving beyond my protective environment. There was a stop at McDonald’s on the way home. My granddaughter announced that she’d never been to McDonald’s. No doubt she’s probably the only child in that entire school who has never been to McDonald’s. I don’t know exactly how the conversation went, but she proceeded to tell them that she isn’t allowed to eat there because the trees in the rain forest are chopped down to feed the cattle. She also told them how her favorite food is sushi. At the end of the discussion, the kids all agreed that they should stop somewhere else to eat next year! What’s remarkable is the kids had a discussion about the ethical implications of where to eat. Probably even more remarkable is they made a group decision based on their discussion. First graders! Maybe adults need a refresher course on the importance of open and respectful discussion, and group consensus. It seems that the influence of polls or what others think has replaced the power of conviction in many of our leaders. We’ve lost our willingness to examine our motives, evaluate the ramifications of our actions, and the implications that ripple beyond our own sphere. We don’t want to wrestle with how we are all connected beyond our homes and borders. We don’t want to think that where we eat has an impact for someone or some place else. I hope my granddaughter doesn’t lose her ability to share her convictions and engage in an open dialogue with others who have a different perspective. No, she didn’t have a hamburger. An ice cream cone was a nice alternative.